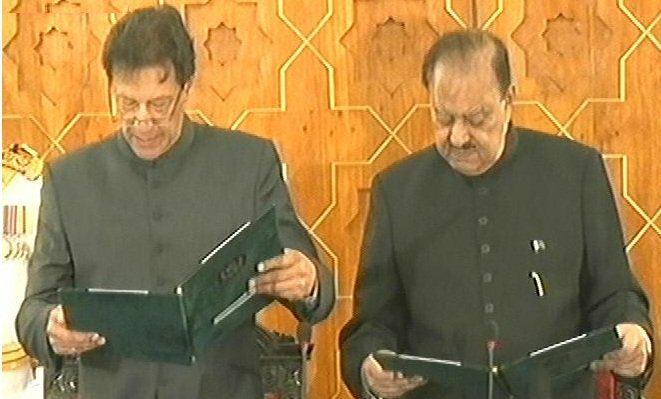 Imran Khan takes oath as new #PrimeMinister of Pakistan. President Mamnoon Hussain administered oath of office to the newly elected Prime Minister. PM Imran Khan took charge of Pakistan, the country the debt ridden and rampant corruption at its zenith with foreign reserve dwindle to half. Pakistan Tehreek-e-Insaf spokesperson Fawad Chaudhry on Saturday said Prime Minister Imran Khan has nominated Arif Alvi for President of Pakistan.Incumbent President Mamnoon Hussain’s tenure ends on September 4. Alvi emerged victor from NA-247, Karachi constituency during the July 25 polls. He was also elected member of the National Assembly in the 2013 General Election. A dentist by profession, Alvi is one of the founding members of PTI. Prime Minister Imran Khan assumed charge of office after taking oath as Pakistan’s 22nd premier on Saturday. President Hussain said the words “Roz-e-Qiyaamat” (the day of Judgement), Khan did not hear the exact phrase and called out the words wrongly terming them as “Roz-e-Qiyaadat” (the day of leadership) hence completely changing the meaning of the sentence. Once corrected by the president, Khan realised his mistake, smiled subtly, said “sorry” and continued with his oath taking. Some Pakistani journalists even wondered if the prime minister’s oath has changed from past years, The News reported. Imran, in hung parliament received requisite votes to defeat, the Pakistan Muslim League-Nawaz President Shehbaz Sharif in the PM election a day earlier, was administered the oath by President Mamnoon Hussain. 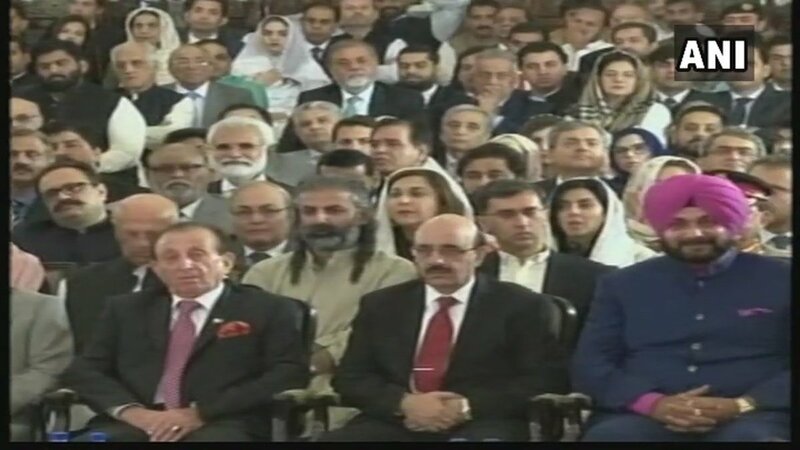 Imran Khan’s wife Bushra Bibi, former Indian cricketer Navjot Singh Sidhu, Wasim Akram, actor Javed Sheikh, Punjab governor designate Chaudhry Sarwar, Punjab Assembly speaker Pervez Elahi, Ramiz Raja, caretaker prime minister Nasir-ul-Mulk and PTI leaders were also in attendance. Imran was presented a guard of honour at Prime Minister House.The Cabinet Secretary also issued a notification of Imran taking charge as prime minister. Mohammad Azam, former chief secretary Khyber Pakhtunkhwa has been posted as Secretary to the Prime Minister, Prime Minister’s Office, with immediate effect. While speaking to media PM Imran Khan said, that he would not spare the ones who looted the country. Further on its corruption and fiscal mess global financial agency has its advice to Pakistan to combat money laundering and terror financing spree. A delegation of the global financial watchdog Financial Action Task Force (FATF) has urged Pakistan to toughen its laws and implementation against terror financing and money laundering, media reports said.